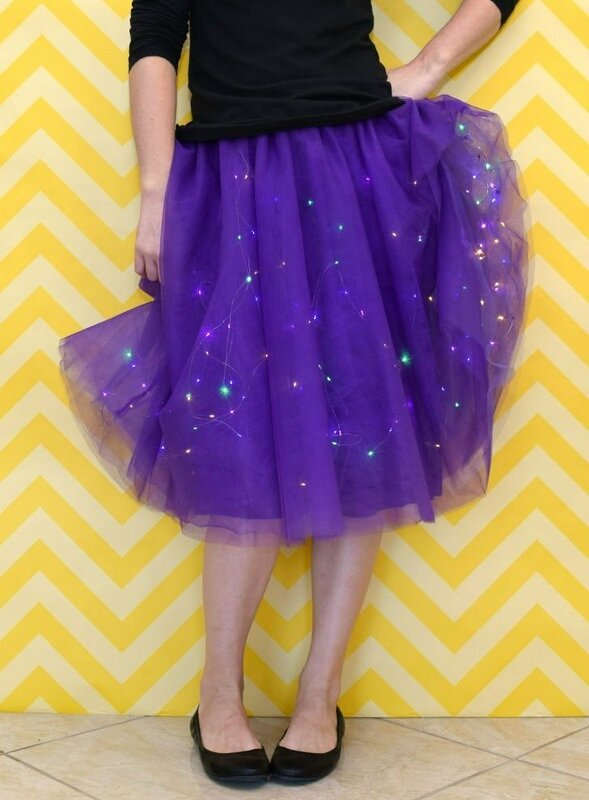 So a while back ago I made myself a galaxy skirt that I painted and added lights to. My sister was watching the boys’ soccer practices and occasionally chatting with me via text when I asked her if she had seen my new skirt. Nope. So I sent a link to that day’s post knowing she was busy and probably wouldn’t get around to actually looking at the post until she got home. And she pretty much texted back as much. And then later, when I’m not even thinking about it any more I get a text stating that the skirt is”ducking amazing. I love it.” To which my response is, “what color do you want me to make you?” And then we took off from there. The plan was to get this sucker whipped up and put in the mail in time for my nephew’s trampoline birthday party. It was a glow in the dark business and I had ordered him a sound/motion activated shirt that said “party animal” with a cat whose glasses would light up like an equalizer. For my sister’s skirt I wanted twice as many lights as what I had and I wanted it to be super comfortable since it was going to be worn for a party where, I find myself often sitting a lot. 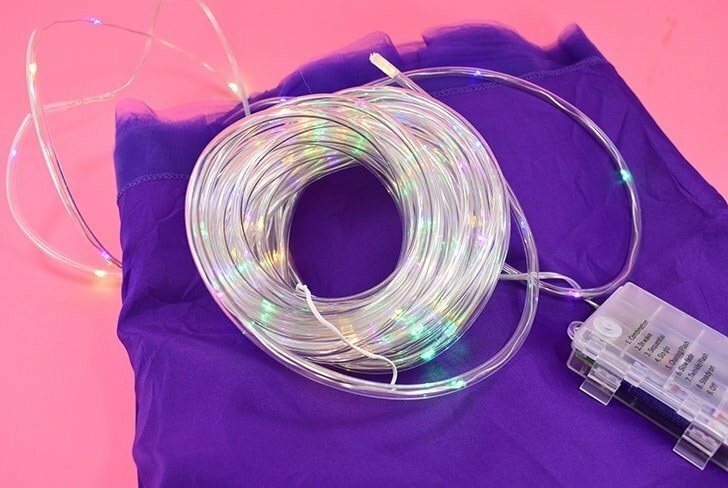 So I went online and found multi-color twinkle lights on a wire for pretty cheap at Amazon. 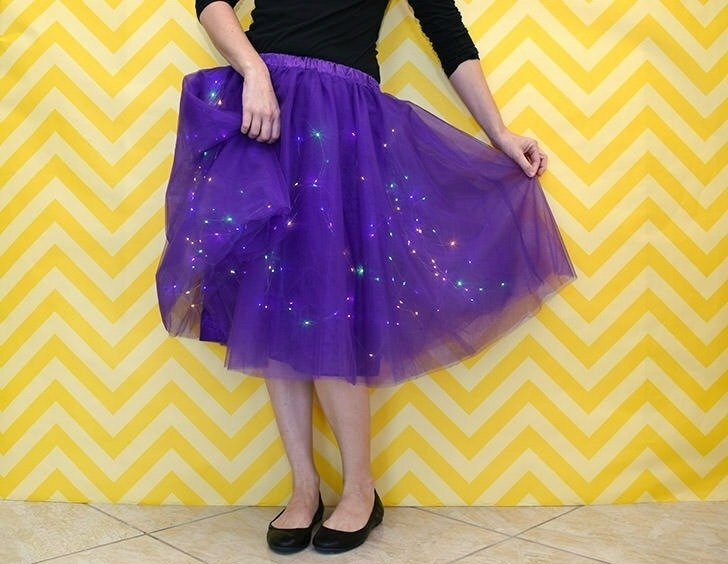 Want to make a twinkle light party skirt? Let’s get after it! 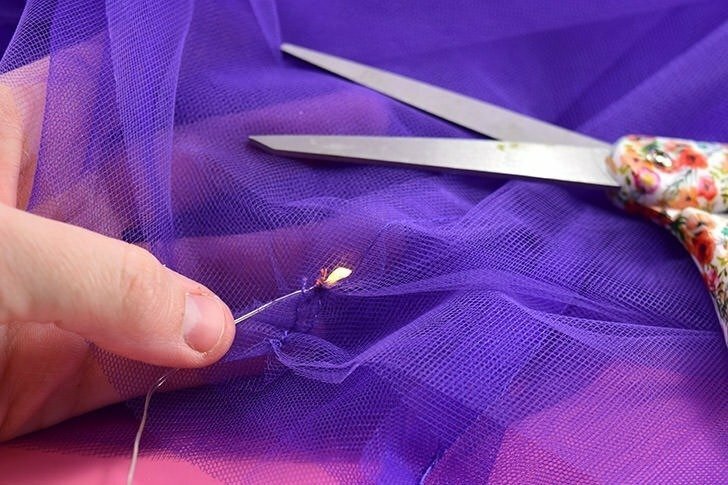 Turn your skirt inside out so that the layer of tulle closest to the silky opaque under skirt is on top (the inner layer will be the first layer inside of the whole business). 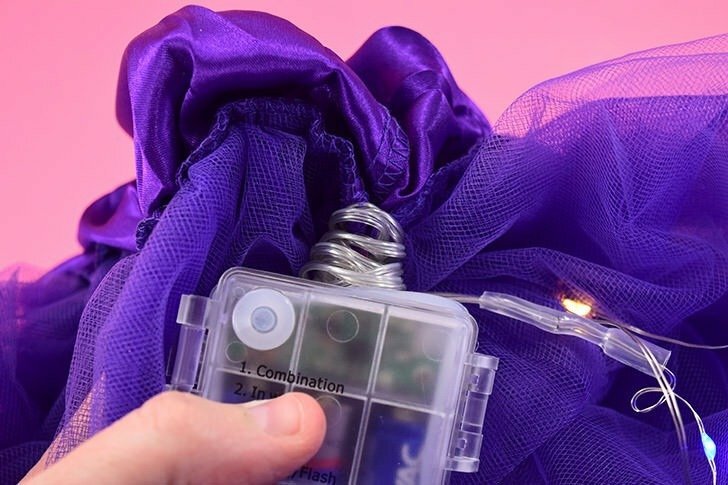 There are 2 if you purchase the same tulle skirt I link to, and to keep the number of lights well distributed we’re going to sew in one set of lights per side. It’s easy to keep track because there is a seam on both sides. 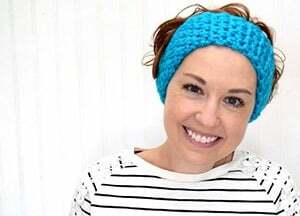 Stitch in your first little light about an inch or 2-3 inches below the waistband of the skirt. There’s no right way to do this and if you don’t have great sewing skills it’s no big deal at all. Just push a threaded needle through the tulle and under the wire of your light. Leave a tail of at least an inch. 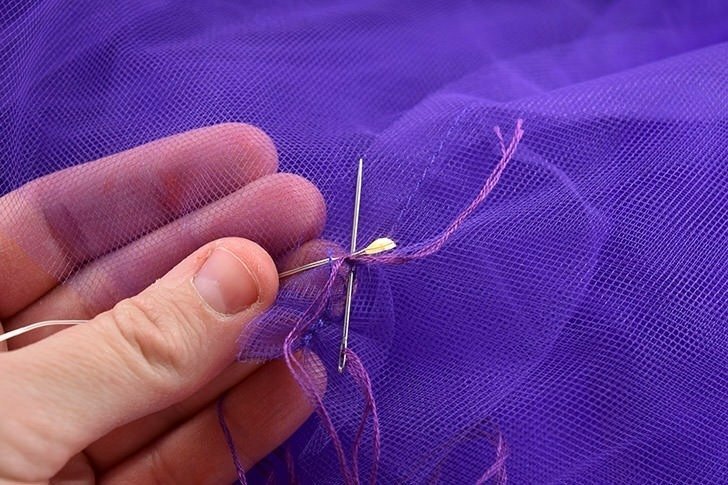 Run your needle over and around and through the tulle a good 4-5 times over, never in the same way twice. Tie an overhand knot 2-3 times with the tail and the thread as it comes off of the needle. Trim the excess thread. 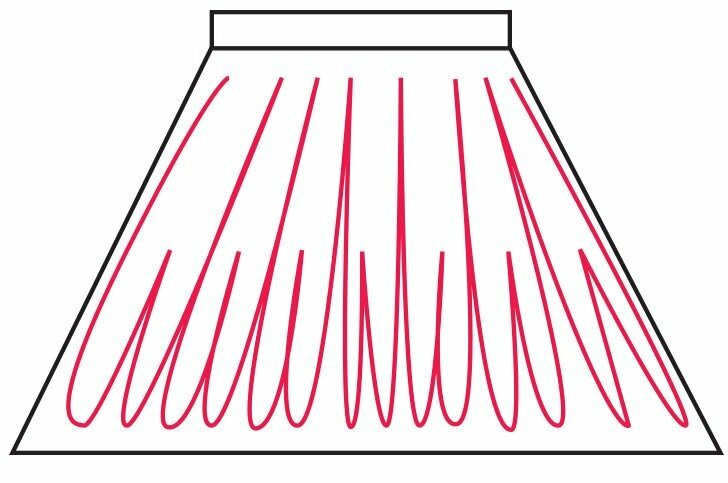 Grab a hold of the light wire about 5 or 6 lights away, or the length needed to reach the bottom hem of the skirt. Tack the light that comes nearest the hem down wherever it lies, continuing working on that innermost layer of tulle. Move up the wire of the lights 2-3 lights, or the length necessary to reach about the middle of the skirt. Going over about 4 inches from where you tacked down light number 2 near the hem, sew in the light nearest the middle in the same, crazy without a plan manner. Now we’re not bringing the lights all of the way up to the waistband every time because the bottom of these skirts flare out. In order to keep the lights more proportionate we have to load up the bottom with more than near the top. Also, if you’re wondering why we don’t tack down every light it’s because A. that’s a lot of friggin’ work and B. keeping most of the lights loose encourages the wire to loop around under the skirt which also helps to give them movement when you walk, adding a fun element to swishing around. and C. if you’re active, like my sister who was at a trampoline birthday party, less tied down means there is less to rip out if something goes awry. Imagine getting something caught on the wire and then yanking away… you could tear a lot of tulle that way. This way if something happens you just have a few spots to mend instead of having to start over with a new skirt. 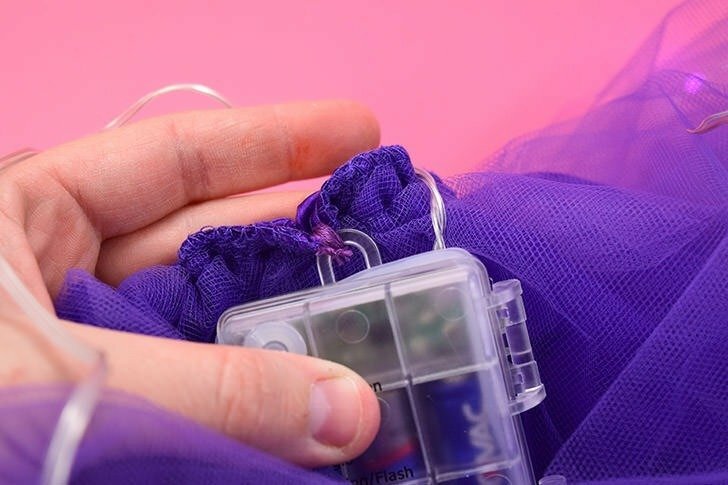 Once you reach the second seam of the skirt and have run out of lights, tack down the battery box to the waistband of the skirt. Continue adding in your second set of lights to the opposite side of the skirt, making sure that you have your 2 battery packs on opposing sides of the waistband to help distribute the weight. If your lights have a ton of cord left over like mine did you can wrap the excess tightly around where you sewed the box onto the waistband to keep it out of the way. Also spy where I had to cut the clear tube away? Ha! I should pay far better attention when I get on Amazon. I’m all, GOOD DEAL, click, order, forget about it until it arrives as a habit since I buy things from there so often! One of the things I really like about this method of tacking in the lights is the extra volume the skirt gets from the wires beneath. 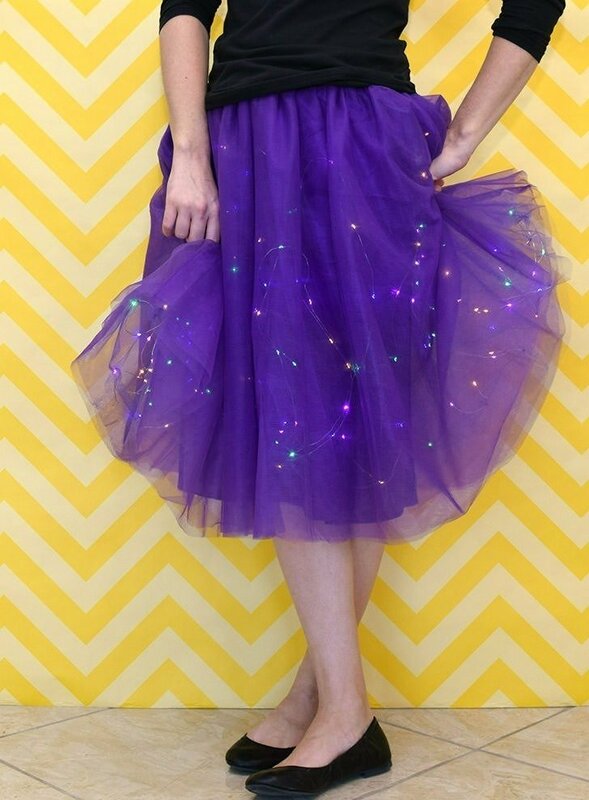 I also love how the lights go with the tulle so when you pull it out to curtsy, or what have you, the lights fill that space too instead of just along the inner opaque skirt. Pretty cool, right? And if you get dancing lights you’re not limited to just having the lights run constantly. My sister’s skirt, here, has 8 different lighting options. 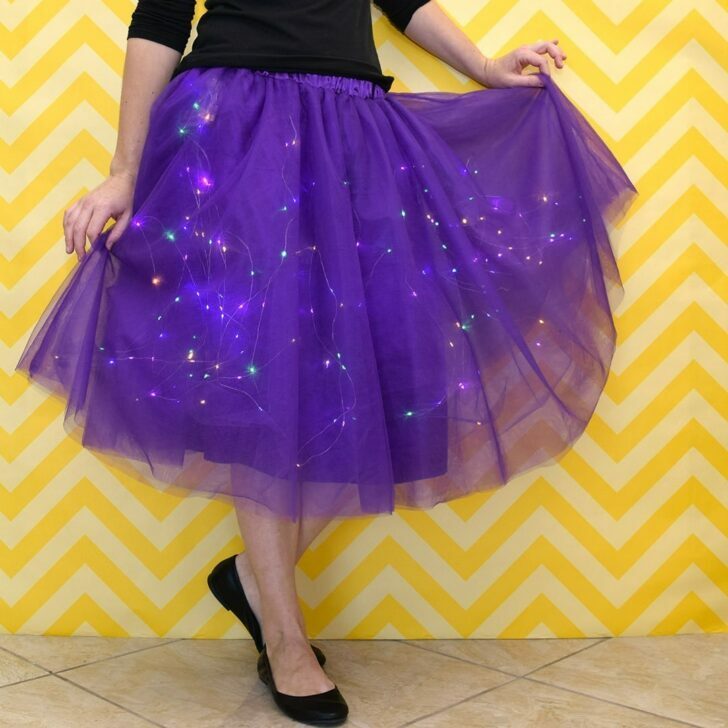 You can see a quick video of my sister’s skirt with the lights in 3 different settings here, but be warned that if you are prone to seizures or other issues that might occur due to flashing lights that I have no clue about, you should skip it.